Unbeaten Rockhampton filly Better Reflection (pink) will be the underdog in the MM Classic field. Classy central Queensland filly Better Reflection has settled in well on the Gold Coast as she prepares for the $2 million Magic Millions Two-Year-Old Classic. As a $20,000 yearling, Better Reflection will have underdog status against a field in which the average price will be about $200,000. 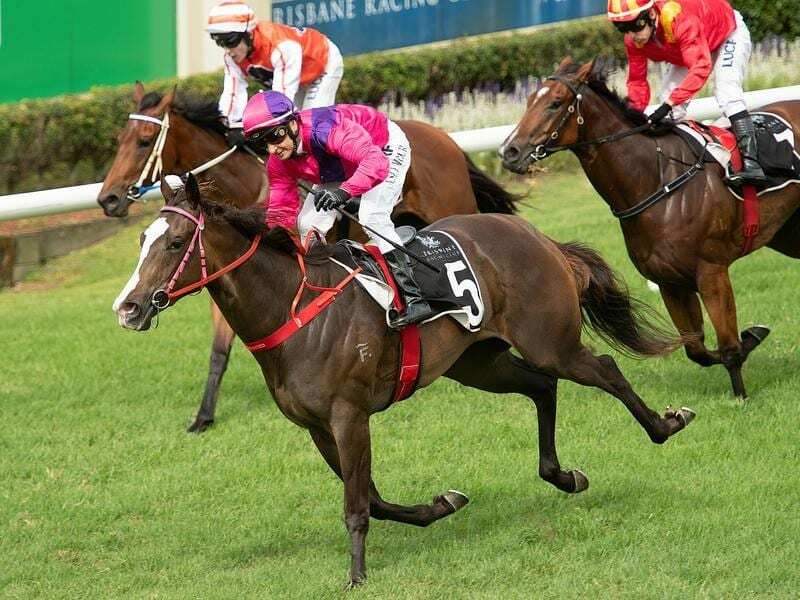 Better Reflection bounded into Millions contention when she won the Listed Calaway Gal Stakes at Doomben three weeks ago, finishing off strongly despite racing wide. Her trainer John Wigginton and jockey Nigel Seymour are growing in confidence the filly can become the second cheapest horse to win the Millions with Our Fiction in 1993 costing $10,000. Wigginton’s previous best win was in the Eye Liner Stakes with Nessuno and Seymour has ridden about 12 feature winners across Australia in two decades of riding. Wigginton said Better Reflection had continued to improve after not showing much when she first came into the stable. The filly trialled well before her debut when she won a 1050m race on her home track by almost six lengths in November which prompted the trip to Doomben. “In the Calaway Gal she did surprise me when she sat three-deep and won so well,” Wigginton said. He decided to bring Better Reflection to the Gold Coast last Wednesday and Seymour made the trip with them. “It took about eight hours but she seems fine,” he said. Seymour got a look at the Gold Coast track on Saturday when he rode unplaced All Eez for Wiggington in the last race.